We’ve all been there. You can’t bear to toss out that half-used expensive moisturizer you bought a year ago, or you have a lipstick that is at least a couple years old that you’re not ready to part ways with. Even Paula is guilty of the latter—she has at least a dozen lipsticks she can’t bear throwing out. This article is a reminder for us on the Paula’s Choice Research Team, too! Hanging on to beauty products past their prime isn’t doing your skin any favors and in fact, might actually be causing the very problems you’re trying to get rid of. This is what you need to know about when to hold them and when to fold them. Don’t Put That on Your Face! It may seem harmless, but expired beauty products can compromise skin. A 2013 study published in the International Journal of Cosmetic Science evaluated the makeup routines and habits of women, and the results were more than a little cringe-worthy. 70% of women in the study used some type of expired product—mostly eye makeup (mascara, eyeliner, eye shadow). 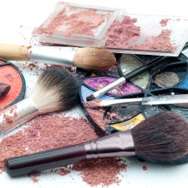 The researchers sampled the eye makeup for contamination, and found that 67% were contaminated! The tricky thing is that only products regulated as over-the-counter drugs (things like sunscreen and anti-acne products) have official expiration dates indicated on their packaging. Many beauty products carry a PAO symbol (a number followed by an M and an open jar icon). Although not a 100% sure bet, the PAO symbol tells you how many months after opening a product, it should be thrown away. For example, a “12M” would mean you should throw the product out 12 months after you've opened it. It is a very good idea to follow that direction. Unfortunately, this information is often on the box, so once you’ve tossed it you won’t remember the expiry date, and even if it is on the container itself, once you’ve started using it you likely won’t remember exactly when you first opened it. Consider using a Sharpie to indicate the date opened on the bottom or back of the package (this can be even more helpful than relying on the PAO date anyway). All of this is especially important for skincare, because in addition to the safety aspect, if the product contains antioxidants, skin-replenishing ingredients, etc. (as it should), they will eventually start to deteriorate, as even in the best packaging they just don’t last forever. A product that seems to have changed color from when you first bought it, has separated into a runny, lumpy mess or developed a strange odor, or feels different on the skin than it once did (especially grainy or streaky)—those are all clear signs it needs to be thrown it away. The other basic guideline to know is that emollient or liquid textured products get contaminated far faster than powders. Lastly, if your product is labeled "preservative-free" you should definitely be concerned, because without some kind of preservative system contamination happens quickly (think of how long a head of lettuce lasts in your refrigerator). While product types vary in their toss dates, so do the conditions that they are stored in. If you’ve been good about keeping the product away from the air and light, the container keeps your fingers out of the product, you never let them sit in your car on a hot day, and you don’t share the product (even with family members) you can follow the longest out use-by-date. Use these guidelines for prolonging the shelf life of your products. DO store products in a cabinet or drawer. DO wash your hands before using products. DO tighten/secure the cap after each use. DO consider how climate and humidity will shorten a product's shelf life. DO toss out eye products after you've had an eye infection. DO abide by the expiration dates on sunscreens, acne products, and prescription products. DON'T buy products packaged in jars of any kind. Jar packaging, isn’t ideal for a number of reasons, including the fact that it carries a high risk of contamination due to dipping your fingers in the formula. DON’T store your products in the refrigerator. Skincare formulas are designed to withstand the average fluctuations in temperature in your home, but not long-term heat or cold storage—that means keeping your products in your fridge (or in your car on a hot day) will shorten their lifespan and stability. DON'T store products in direct sunlight (for example, don’t keep them on a sunny windowsill). DON'T share your makeup and skincare products with others. DON'T add water or saliva to thin out or remoisten products. And remember, if it smells off, looks gunky or the texture has changed significantly—definitely toss it out!